Vice President Yemi Osinbajo was in Onitsha, Anambra state yesterday to flag off the party's governorship campaign in the state. 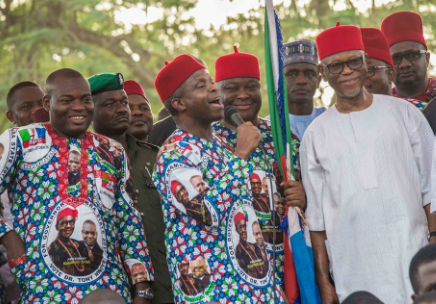 While speaking to the party members to vote for the party's candidate, Tony Nwoye, during the November 18th election, Osinbajo said the party does not make promises it doesn't keep and that they would keep every electoral promise they make to Anambra residents. 'I have come on behalf of Mr. President, many people know already that our President is a man who loves this State, and if you are looking for evidence that he loves this State, I am sure that you will not look very far. The first time that he ran for President, his running mate was from this State, yes, Chief Chuba Okadigbo. The second time that he ran, his running mate was from this State also, Chief Ume-Ezeoke. So I want you to give Mr. President 3 Gbosas! (Crowd responds!) The APC government is a government that will do everything it has promised. We are not making promises for nothing. The second Niger Bridge, we have been talking about it for a long time, but for the first time, the President went by himself to negotiate the facility to do that second Niger Bridge. That is why the second Niger Bridge is in our current budget and we have provided for it. In fact, I am being reminded that just two days ago, the Sovereign Wealth Fund paid N2billion for that same project. (Sum paid to the contractor Julius Berger for early works) We will definitely see our second Niger Bridge, we will not make promises we cannot keep. When we were talking about railways, Lagos – Calabar railway, under the old administration, I will not mention them by name, they said Lagos will go to Calabar, there was no connection to the Southeast. It was when President Muhammadu Buhari came, that we re-designed the Lagos – Calabar, in order to pass through Onitsha in the first place. That new design is what we also have- the Port Harcourt - Maiduguri railway, which has a connection to Umuahia, Owerri, Enugu, and Awka. So we will not make promises we cannot keep, we will keep our promises'. 'This State was the first to receive our Home-Grown School Feeding Programme, we gave this State money first for that programme. And we have already in 807 schools, here in Anambra State, fed young children in primary schools. We have over 103,000 children that are already being fed here in Anambra. The school feeding programme is an APC programme and we have engaged over a thousand cooks. Also, we have our N-Power programme for young graduates. Already we have employed 4,518 young graduates and we intend to increase the number. We will not make any promise we cannot keep. That is why I am so sure you will be making the right choice, you will be doing the right thing. How many people know that when you do the right thing, you will get the right result? One plus one is two not two and a half, two plus two is four not four and a half. If you make the right choice, you will get the right results. When we made the right choice and voted the APC, we are getting the right results. By the grace of God, you in Anambra State will also get the right results. So it is my very special pleasure now, to invite the National Chairman to present our flag, I am going to join him. The proper person to present the flag is our Chairman, so that it will be valid, because we don’t want any invalid presentation of our flag, and I will also accompany him and all of us here will accompany him'.